For those who love classic holiday films, the Yuletide truly can be the most wonderful time of the year. At the same time it can be a source of frustration. Often one will want to watch a holiday movie, only to find cable channels and TV stations are showing films that actually have very little to do with Christmas (Little Women and Meet Me in St. Louis come to mind). Sadly, while the various cable channels and TV stations are sometimes showing films that have very little Christmas in them, they are ignoring films that have a great deal to do with the holiday. Here is a list of ten films that are quite firmly holiday movies. 1. The Apartment (1960): Okay, I know I mention The Apartment every single time I mention Christmas movies, but there are two very good reasons for this. First, it is my second favourite movie of all time and widely considered one of the greatest films of all time. Second, it is blatantly a Christmas movie. The Apartment takes place from sometime in November (I always thought it was around Thanksgiving) to New Year's Eve, and Christmas plays a central role in the plot. In fact, the holiday season (and specifically Christmas and New Year's) are so pivotal to its plot that The Apartment could not possibly take place any other time of year. 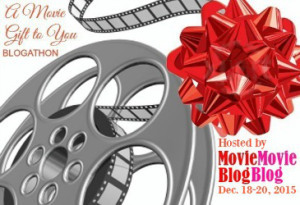 Sadly, it is often overlooked when it comes to lists of Christmas movies and it is not very often that it is shown this time of year. 2. Bell, Book, and Candle (1958): Like The Apartment, this film is set during the holiday season. Bell, Book, and Candle begins shortly before Christmas and ends on New Year's. Both Christmas and New Year's play a central role in the plot, and the film probably would not work quite so well when set at any other time of year. I can only guess that since Bell, Book, and Candle deals with witches, people associate it more with Halloween than Christmas. Regardless, it is firmly a Christmas movie. While it is essentially a romantic comedy, it does deal with many of the more common holiday themes: acceptance, family, friendship, and redemption. Also, any film starring Pyewacket the Cat is required holiday viewing! 3. Die Hard (1988): Die Hard takes place entirely on Christmas Eve. What is more, it begins at a Christmas party, complete with Christmas decorations, a Christmas tree, and Christmas carols. The movie even deals with themes traditionally associated with the holidays: family, love, and redemption. It is much more of a Christmas movie than any version of Little Women ever has been. Despite this, it rarely makes lists of classic Christmas movies and it is only rarely shown in December. I suspect there are two reasons for this. First, Die Hard was, oddly enough, released in the middle of summer, on July 15 1988. Second, it is an action movie, a genre not generally known for its holiday offerings. Regardless, Die Hard is clearly a Christmas movie and perfect for holiday viewing. 4. Gremlins (1984): Gremlins is set during the holiday season and, in fact, the entire movie begins with a father looking for a gift for his son for Christmas. Gremlins features all the traditional holiday imagery, from Christmas lights to Santa Claus, as well as a soundtrack that includes the greatest rock 'n' roll Christmas song ever, Darlene Love's "Christmas (Baby Please Come Home)". The film even includes themes suitable to the holiday, such as love and family. That having been said, it is rarely included in lists of Christmas movies. I suspect this is for two reasons. First, it was released in late spring (June 8 1984). Second, it is a horror black comedy, genres that are not often associated with the holiday. Despite this, it is very much a Christmas movie. 5. I'll Be Seeing You (1944): I'll Be Seeing You was a hit upon its release in 1944, raking in over $6 million. It centres on Joseph Cotten as Sgt. Zachary Morgan, a soldier suffering from what we would today call Post Traumatic Stress Disorder, and Ginger Rogers as Mary Marshall, a woman convicted of manslaughter when she was only defending herself. The film explores these two social misfits as their relationship develops. It is set from a little before Christmas to New Year's Eve, and the holidays are central to its plot. Sadly, while I'll Be Seeing You was a box office hit, it seems to me that it has largely been forgotten now. Classic film buffs are aware of the movie, but the general public doesn't seem to be. This is sad, as it is truly a holiday movie worth seeing. Not only does it deal with the holiday itself, but it boasts great performances from its leads and a supporting cast that includes Spring Byington, Tom Tully, and Shirley Temple. 6. It Happened On Fifth Avenue (1947): I was a bit hesitant to include this film on the list, as I know many classic movie buffs who count it as one of their absolute favourites among Christmas movies, ranking it alongside It's a Wonderful Life and Miracle on 34th Street. Indeed, Turner Classic Movies has aired it during the holiday season for the past several years, usually more than once each season. That having been said, I think the average person has probably never even heard of the film. That is a shame, as it is truly one of the best holiday movies ever made. The film centres on a hobo, Aloyisius T. McKeever (played by Victor Moore), who has a unique way of surviving winter. He simply moves into the vacated mansion of the 2nd richest man in the world, Michael J. O'Connor (played by Charles Ruggles), and leaves shortly before Mr. O'Connor returns in the spring. As might be expected, McKeever finds his stay at the mansion complicated one December. It Happened On Fifth Avenue is a truly wonderful film that deals with holiday themes and should really be better known than it is. 7: Scrooge (1935): When people think of adaptations of A Christmas Carol, they probably think of MGM's 1938 film or the 1951 version starring Alastair Sim. Before either of these versions, however, was the 1935 version starring Sir Seymour Hicks. Scrooge was the first feature film with sound to be based on the novel. Sir Seymour Hicks had also already played the role both on stage and in silent films. Scrooge is not a perfect film (the casting of Scrooge's lost love Belle always seemed odd to me), but it is much more loyal to the source material than many versions. Indeed, aside from Belle, the film has a nearly perfect cast. After years of playing the role Sir Seymour Hicks is impressive as Scrooge. Donald Calthrop is one of the best Bob Crachits ever. He even looks like Bob Cratchit in the illustrations from the original printing of the novel. While I am not going to say Scrooge is a better film than the 1951 version, I suspect most Charles Dickens fans will appreciate it more than MGM's 1938 version (which really departs from the source material very dramatically). 8. The Thin Man (1934): Okay, The Thin Man is hardly an overlooked film. The movie was so successful at the box office that it sparked a whole series of "Thin Man"movies. What is more, it remains one of the best loved films of all time. That having been said, it is often excluded from lists of Christmas movies, even though the plot unfolds during the holiday season. Indeed, Christmas plays a big role in the film, with Nick Charles trimming the tree as well as Nick and Nora holding a holiday party. Despite this and despite the great love even the general public has for the film, The Thin Man is not often included in lists of holiday films. Truthfully, it really should be included in such lists. After all, it deals more with Christmas than many other films shown during the season (such as Little Women....). 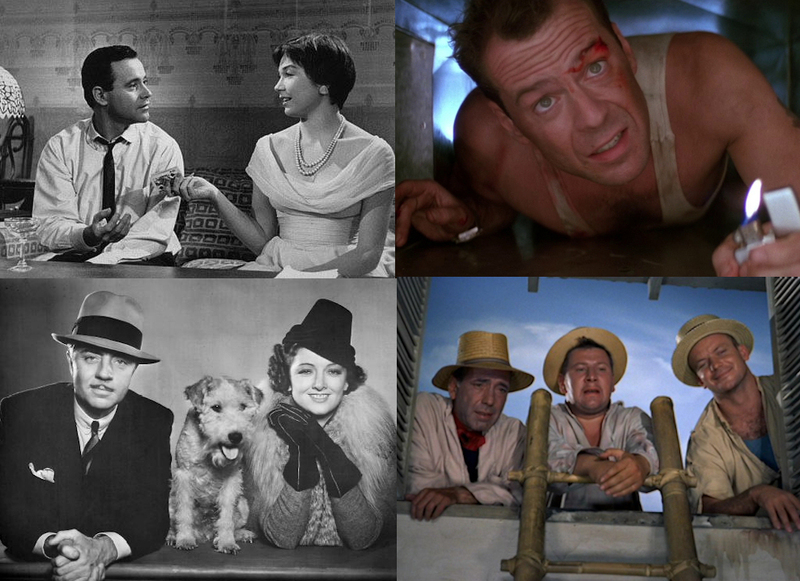 I suspect The Thin Man is the 1930s equivalent of Die Hard and Gremlins. Quite simply, it belongs to a genre not often associated with Christmas (it's a mystery). 9. 3 Godfathers (1948): 3 Godfathers is actually a remake of another film. The first version of Three Godfathers was made in 1916. It was based on the 1913 novel of the same name by Peter B. Kyne. A second version, under the title Marked Men, was made in 1919. A third version, starring Chester Morris, was made in 1936. It was director John Ford who made what is the quintessential version, 3 Godfathers, which was released in 1948. 3 Godfathers stars John Wayne; Harry Carey Jr., and Pedro Armendáriz as three outlaws who find themselves helping a woman about to give birth during the holiday season. 3 Godfathers is very much a Christmas film. Not only does it feature many trappings of the season, such as Christmas carols, but it even contains a supernatural element common to holiday films. Sadly, 3 Godfathers rarely makes lists of holiday films. I can only suspect that it is because it is a Western, a genre not often associated with Christmas. 10. We're No Angels (1955): We're No Angels stars Humphrey Bogart, Aldo Ray, and Peter Ustinov as three escapees from Devil's Island right before Christmas who only mean to stay in a small French colonial village for the night. As it turns out, they find themselves helping various people in the village. We're No Angels centres on themes commonly associated with the holiday, namely helping one's fellow man. It also happens to be a very funny movie with a great cast. Sadly, while it is set during the holiday season, it is rarely included in lists of Christmas movies. This is really a shame, as it has a much stronger link to the holiday than many other films shown this time of year. There is perhaps no bigger time for gift giving than the Yuletide. Indeed, the retail industry actually thrives upon the holidays like they do no other time of year. I don't know if most people are like me, but I prefer to receive gifts that have some meaning to me and prefer to give gifts to those in my life that have some meaning for them. Of course, as a classic film buff ultimately the gifts that have meaning for me and many of my friends as well tend to be movies. For at least one person (probably more) in my life the classic animated movie Yellow Submarine would be the perfect gift. 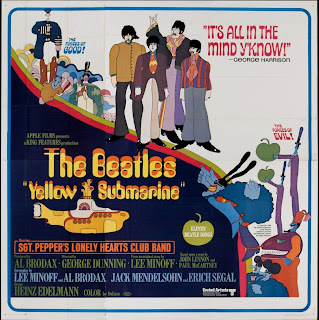 For those of you who have never seen the film, Yellow Submarine is an animated film featuring the music of The Beatles. The plot is fairly simple. The "unearthly paradise" of Pepperland is besieged by the Blue Meanies, a group of creatures who hate anything happy, especially music. With Pepperland's resident guardians, Sgt. Pepper's Lonely Hearts Club Band, taken out of action, Old Fred (voiced by Lance Percival) is sent forth to find someone to save Pepperland from the Blue Meanies. The individuals Old Fred recruits for the job are none other than The Beatles, who just happen to have a striking resemblance to Sgt. Pepper's Lonely Hearts Club Band. As might be expected, the film features several of The Beatles' classic songs, from "Nowhere Man" to "Sgt. Pepper's Lonely Hearts Club Band"
While Yellow Submarine would make a great gift for many of my friends, I have one very dear friend for whom it would be ideal. Like myself she is an Anglophile (although she is Italian) and particularly loves the era of Swinging London (including the Mod subculture). Not surprisingly she is just as much of a fan of The Beatles and other British Invasion bands as I am (she got me The Who Sell Out for Christmas). She also happens to be an animation fan, everything from anime to the classic Disney movies. That makes Yellow Submarine the perfect film for her. Today Yellow Submarine is regarded by many as one of the greatest animated films of all time. That having been said, it emerged from a most unexpected source. In 1965 King Features Syndicate produced the Saturday morning cartoon The Beatles, which aired on ABC from 1965 to 1969. While the cartoon was a hit with youngsters, The Beatles did not particularly care for the cartoon at the time. John Lennon himself complained that it made them look like "the bloody Flintstones." Eventually King Features' head of motion picture and television development at the time, Al Brodax, proposed producing an animated feature based on The Beatles' songs, suggesting to the band's manager Brian Epstein that the film could satisfy The Beatles' agreement with United Artists for a third film after A Hard Days Night and Help!. Once he had the rights to do the film, Al Broadax hired TVC London to produce the feature itself. Yellow Submarine was directed by the late, great George Dunning of TVC London, and Jack Stokes of TVC London served as its animation director. Al Brodax would have simply been happy with a feature film version of the Saturday morning cartoon, but the film that emerged was ultimately very different. While The Beatles utilised the extremely limited animation common to Saturday morning cartoons of the time, Yellow Submarine is perhaps better described as stylised, full animation. What is more, Yellow Submarine was a bold departure from previous animated cartoons. It was the first animated feature to draw upon the Pop Art of the day, psychedelia, Op Art, and many other modern artistic styles. It was also the first animated film with a rock soundtrack and the first animated feature with characters based upon real people (The Beatles). Of course, given how they viewed the Saturday morning cartoon, The Beatles were initially not very enthusiastic about Yellow Submarine. Even if their busy schedules had permitted them to do so, The Beatles probably would not have provided their own voices for the film (in the film John Clive voiced John, Geoff Hughes voiced Paul, Peter Batten voiced George, and Paul Angelis voiced Ringo). The Beatles changed their minds after seeing rushes from Yellow Submarine and even agreed to make a live-action cameo at the end of the film. 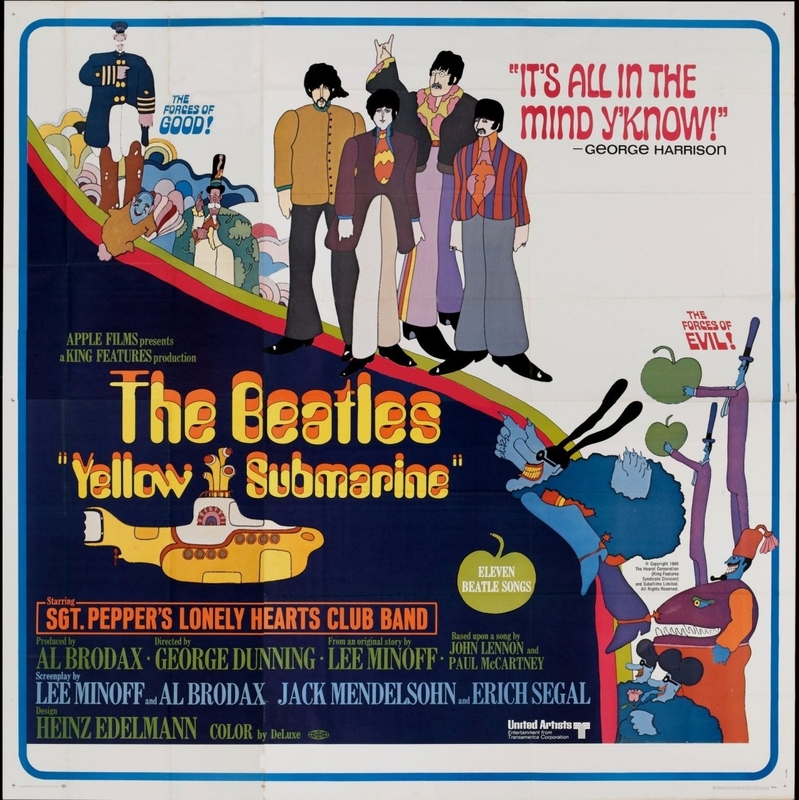 Yellow Submarine did fairly well at the box office in the United Kingdom when it was released on July 17 1968 in the United Kingdom. It did even better in the United States, where it was released on November 13 1968 and became a box office hit. On both sides of The Pond it received largely sterling reviews from critics. Since then it has since become regarded as a classic. In fact, Time magazine included it in their list of "The 25 All-Time Best Animated Films". The film boasts an impressive a 96% percent rating on the web site Rotten Tomatoes. For my dear friend who loves The Beatles and classic animation, Yellow Submarine would make a nearly perfect gift. What is more, in many respects Yellow Submarine is a perfect film for the holiday season. While it is true the film appears to be set in the summer and has makes no mention of Christmas at all, the movie's themes fit the holidays quite well. After all, here is a film where The Beatles triumph over evil not through any sort of violence, but through the sheer power of music and, of course, love (which is all you need, as the song says...). Not only is Yellow Submarine then the perfect gift for any Beatles fan who also loves animation, but it is also in many respects perfect holiday viewing. In the 1947 classic film Miracle on 34th Street the commercialisation of Christmas is criticised. Eighteen years later in the classic TV special A Charlie Brown Christmas the commercialisation of Christmas was once more attacked. Today, fifty years after the debut of A Charlie Brown Christmas, the commercialisation of Christmas is still criticised. Just as people have been criticising the commercialisation of Christmas for a very long time, so too has advertising used the visual imagery of the holiday for a very long time. In fact, the first advertisements with Christmas themes appeared in the late 19th Century. By the 1920s the use of Christmas imagery in advertisements was an established practice. With the advent of regularly scheduled broadcast television in the United States, it became only a matter of time before there would be Christmas themed television commercials. And while Americans are often prone to complain about the commercialisation of the holiday, they often have their favourite Christmas themed commercials. I am no different, so I thought I would compile a list of what I considered the greatest Christmas commercials of all time. Here they are from number five to number one. 4. M&M's "Christmas Faint": Animated, anthropomorphic M&M characters first appeared in a television commercial all the way back in 1954. That having been said, the modern day characters of Red and Yellow would not appear until 1995. Over the years they have appeared in a large number of M&M's commercials. This Christmas commercial, entitled "Christmas Faint", may be the most enduring of them all. The commercial made its debut on December 5 1996 and is still airing nineteen years later. 3. Campbell's Soup, "Snowman": Strictly speaking, the Campbell's Soup commercial "Snowman" is perhaps better described as a "winter commercial" rather than a Christmas commercial.While it usually airs during the holidays, it has aired much later, often into January or even February. The commercial is rather simple. As the song "Let It Snow! Let It Snow! Let It Snow!" plays, a snowman makes his way inside. This is another commercial that has had lasting power. It first aired in 1993. 2. Hershey's Kisses Christmas Commercial: Another simple, but lasting commercial. The commercial consists of Hershey's Kisses in holiday coloured wrappers playing "We Wish You a Merry Christmas" as if they were bells. The commercial first debuted in 1989 and is still airing to this day. It is Hershey's longest running commercial. 1. Norelco Santa Claus: Arguably Norelco's Santa Claus commercials are the all time champion when it comes to Christmas commercials. For those who have never seen the commercials, they originally featured a stop-motion Santa Claus riding a Norelco electric razor as if it was a sled through a winter wonderland. Later commercials would utilise computer animation. The original commercial debuted in 1961 and would be updated through the years. Ultimately Norelco's Santa commercials proved so popular that they lasted until 1996. The public's demand for the return of the Santa commercials was so great that Norelco eventually revived them in 2002. Here it must be pointed out that Norelco's stop-motion Santa Claus actually pre-dates the classic Rankin/Bass special Rudoph the Red-Nosed Reindeer, which debuted in 1964 (three years after the first Norelco Santa ad aired). As mentioned earlier, Norelco updated the Santa Claus ad through the years, so that there are several different versions. Here is a collection of various Norelco Santa ads from through the years. 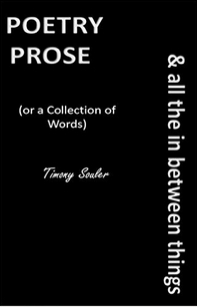 My dear friend Timony Souler has put out a chap book entitled Poetry, Prose & All the In-Between Things. It is different from most books on the market, a fact that makes it a bit difficult to describe. It is collection of poems and what I would call "vignettes". Essentially the vignettes are glimpses into the lives and thoughts of various individuals. They range from those that are slightly humorous to those dealing with much darker material. The poems are similar to the vignettes in that they also offer glimpses into the lives of people. And like the vignettes they range from lighter subjects to much bleaker material. Poetry, Prose & All the In-Between Things ranges from work that is heartfelt and beautiful to work that can be frightening and disturbing. It all makes for compelling reading. If you're interested in a good book that can be read in one setting, you might want to check out Poetry, Prose & All the In-Between Things. It is available on Amazon. 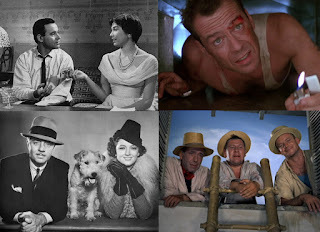 Turner Classic Movies released their "TCM Remembers" segment this past Friday, December 11 2015. As usual they did a wonderful job of paying tribute to those who have died in the past year. Sadly, 2015 has seen many of the greats die, among which were many of my favourites. Rod Taylor, Lizabeth Scott, Leonard Nimoy, Joan Leslie, Omar Sharif, Louis Jourdan, Sir Christopher Lee, and the great Maureen O'Hara. While TCM always does a fairly good job of including the stars who have died over the year, sadly I did notice a few omissions this year. The most glaring for me was Patrick Macnee, whose death had the most impact for me of any celebrity who died this year. While there can be no doubt that he is best known for his role as John Steed on The Avengers on television, he did appear in films, including A Christmas Carol (1951--also known as Scrooge), in which he played young Jacob Marley, Les Girls (1957), and A View to a Kill (1985). They also omitted another one of my favourites, Martin Milner. While Mr. Milner was also best known for his work in television (Route 66 and Adam-12), he made some very notable appearances on film, including Sweet Smell of Success (1957), Gunfight at the O.K. Corral (1957), and Marjorie Morningstar (1958). I was also surprised that they left out songbird Monica Lewis. While Miss Lewis did not make that many movies, she made an impression in those films in which she appeared. I might also add that I know of no classic film buff who wasn't a little bit in love with her. Regardless, Turner Classic Movies has once more done a fine job. Yesterday I watched Bing Crosby's Merrie Olde Christmas. Today it is best remembered for two things. The first is that it was Bing Crosby's last Christmas special. In fact, it aired only about a month and a half after Mr. Crosby's death from a heart attack at age 74. The second is that the special featured David Bowie and Bing Crosby performing the song "Peace on Earth"/"Little Drummer Boy". What is not as well remembered is the fact that it was the first time that David Bowie performed his now classic song "Heroes" on American television. "Heroes" was written by David Bowie and Brian Eno, and drew its inspiration from the 1975 song "Hero" by German band Neu!. While "Heroes" peaked at only no. 24 on the UK singles chart and did not reach the Billboard Hot 100 in the United States at all, it proved to be a hit elsewhere in the world. For instance, it was certified gold in Italy. Since its release on September 23 1977 "Heroes" has grown in reputation. In 2004 Rolling Stone ranked "Heroes" at number 46 in its list of "The 500 Greatest Songs of All Time". In its list of the 30 greatest David Bowie songs, Uncut placed "Heroes" at number one. The song has been featured in such films as Godzilla (1998), The Replacements (2000), Antitrust (2001), and several others. This is not the video that appeared in Bing Crosby's Merrie Olde Christmas, although it is similar in some respects. Interestingly enough, the video featured in Bing Crosby's Merrie Olde Christmas was more outré. One can only wonder what Bing Crosby thought of both the video and the song. 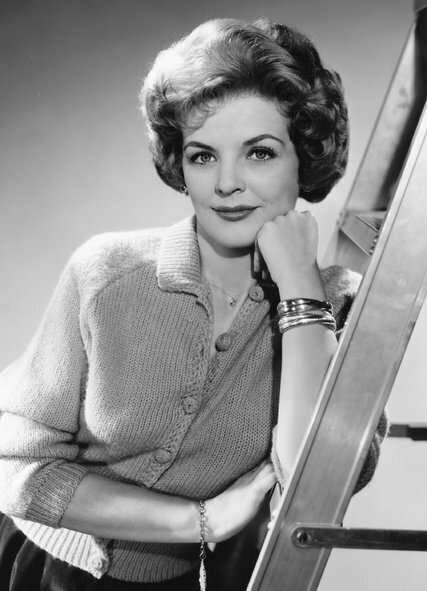 Marjorie Lord, perhaps best known for her role as Kathy "Clancy" Williams on Make Room for Daddy (also known as The Danny Thomas Show), died on November 28 2015 at the age of 97. Marjorie Lord was born Marjorie Wollenberg on July 26 1918 in San Francisco. While she was still very young she studied ballet. Her acting career began when she was only a teenager. She was only 16 when she made her debut on Broadway as a replacement Margaret Anderson in The Old Maid in 1935. She made her film debut in Border Cafe in 1937. In the late Thirties Marjorie Lord appeared in the low budget films On Again-Off Again (1937), Forty Naughty Girls (1937), Hideaway (1937), High Flyers (1937), Girls' School (1938), and The Middleton Family at the New York World's Fair (1939). In the Forties Marjorie Lord appeared in such films as About Face (1942), Escape from Hong Kong (1942), The Adventures of Smilin' Jack (1943), Sherlock Holmes in Washington (1943), Flesh and Fantasy (1943), New Orleans (1947), The Strange Mrs. Crane (1948), Air Hostess (1949), Riding High (1950), and Chain Gang (1950). She appeared on television in Your Show Time and The Magnavox Theatre. She appeared on Broadway in Signature in 1945 and Little Brown Jug in 1948. It was in 1957 that Marjorie Lord was cast in the role of Kathy O'Hara on Make Room for Daddy. Jean Hagen, who had played Danny Williams' wife Margaret, had left the show and her character was written out of the series as having died. It was during the following season that Marjorie Lord was brought onto the show as Kathy, a nurse hired to take care of Danny's son Rusty when he had the measles. Love blossomed between Kathy and Danny. When the show moved to CBS the following season, it opened with Kathy and Danny on their honeymoon in Las Vegas. On CBS Make Room for Daddy (now called The Danny Thomas Show) proved to be a hit. Marjorie Lord remained with the show until it ended its run in 1964. During the Fifties Marjorie Lord also appeared on such shows as Racket Squad, The Adventures of Kit Carson, Four Star Playhouse, GE Theatre, Schlitz Playhouse of Stars, Fireside Theatre, Ford Television Theatre, The Lone Ranger, Hallmark Hall of Fame, Zane Grey Theatre, Wagon Train, and The Lucy-Desi Comedy Hour (as Kathy Williams alongside Danny Thomas as Danny Williams). She appeared in such films as The Valparaiso Story (1951), Stop That Cab (1951), Rebel City (1953), Down Laredo Way (1953), Mexican Manhunt (1953), and Port of Hell (1954). She appeared on Broadway as a replacement in Anniversary Waltz. In the Sixties Marjorie Lord guest starred as Kathy Williams on The Joey Bishop Show. She returned to the role of Kathy Williams in the short-lived sequel/spinoff series Make Room for Granddaddy. She guest starred on The Danny Thomas Hour and Love, American Style. She appeared on the TV specials Special for Women: The Menace of Age and The Danny Thomas Reunion Special. She appeared in the film Boy, Did I Get a Wrong Number! (1966). She appeared on Broadway in The Girl in the Freudian Slip. From the Seventies into the Eighties Marjorie Lord guest starred on the shows The Hardy Boys/Nancy Drew Mysteries, Fantasy Island, and The Love Boat. She was a regular on the short lived series Sweet Surrender. She appeared in the TV movies The Missing Are Deadly, Harold Robbins' The Pirate, and Side by Side. There can be no doubt that Marjorie Lord will always be best remembered as Kathy "Clancy" Williams on Make Room for Daddy. That having been said, it is a very good role for which to be remembered. Kathy was far removed from most female characters on television at the time. It was she who proposed to Danny Williams, not the other way around, a move that was somewhat revolutionary for the Fifties when it was always the man who proposed. And while Kathy gave up her nursing career to be a housewife, she hardly gave up her independence. Unlike many housewives on other sitcoms, Kathy was not afraid to speak her mind, often with a tongue that was razor sharp. While Marjorie Lord was typecast after Make Room for Daddy, she could play other roles and often did in the B movies she made before finding film on television. In Escape from Hong Kong (1942) she played a British double agent. In The Strange Mrs.Crane (1948) she played a woman who, to hide her criminal past, creates a whole new identity. While Marjorie Lord may have been best known for playing a wife and mother, she was capable of playing other roles.